It's the dark wallpaper on the walls. Well, we'll have that off soon enough. Noel suggested I go and re-shoot comparison photos from the same spots as I did before we started. So here we are. 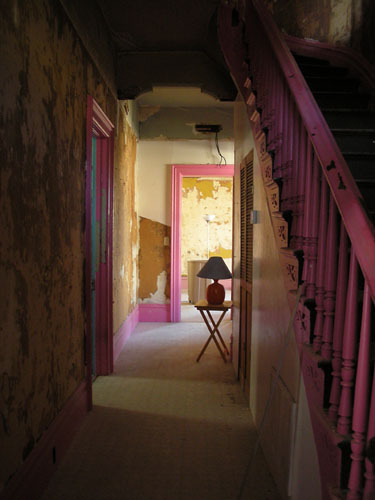 This is mid-morning in the hallway, looking to the dining room, which just glows with light. This is about as bright as it gets in the hall, though. 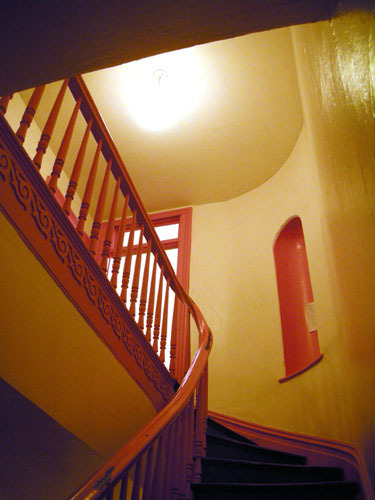 And looking up the stairs, you suddenly see how graceful the proportions of the stair were supposed to be. Before that chunky lowered ceiling under the stairs made them look fat and ungainly. And the transom light over the bathroom door was disturbingly close to the ceiling. 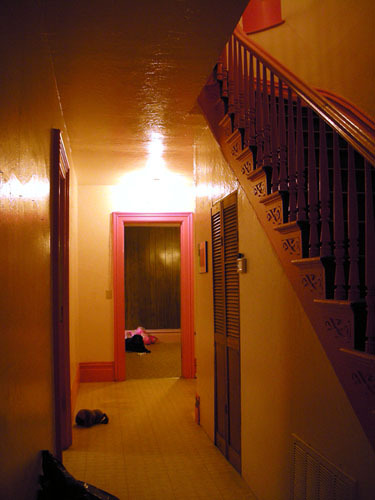 Now the hallway is dark, but the height makes it feel lighter and more spacious. Looking at the before picture, you see how the lowered ceiling closes up the space for the stairwell, and hangs heavily over the front door. I can't wait to get the arched window over the door in reasonable shape again. I'm thinking of doing some stained glass to fill it, with the same morning glory design on the parlour ceiling medallions. The biggest change was the dining room. The bay now looks tall and graceful. 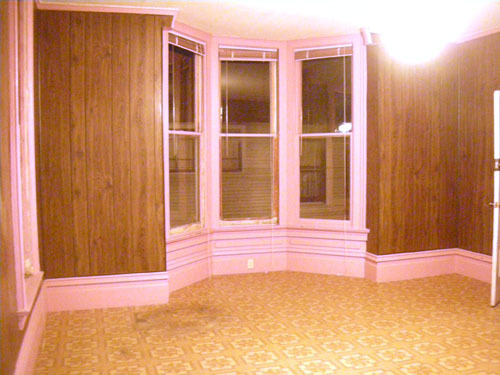 OK, the pink still looks horrific and combining it with mustard yellow and brown from the paint and wallpaper we uncovered does not look so hot, but the proportions of the room make sense now. The before is just depressing. This room was always intolerably dark even with sunlight pouring in. This afternoon Noel climbed in to the attic and wired the bathroom lights onto a different circuit so we would have light in there, at least. Small victories. We've been talking about the condition of the dining room ceiling and that of the hallway since we finished up last night. And now we think we'll take the plaster and lath down rather than trying to repair it. The plaster is really iffy; iffy enough that I'm positive it would fall and possibly kill somebody when we have our next big earthquake, even repaired as best I could. 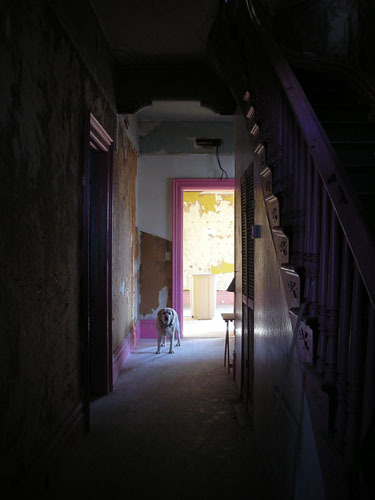 But we need to deal with some of the root causes first: the plaster is bad because there are leaks in the roof. There are leaks in the roof because none of the valleys are flashed, and we have some really wonky roofing where the side porch roof meets the house wall. 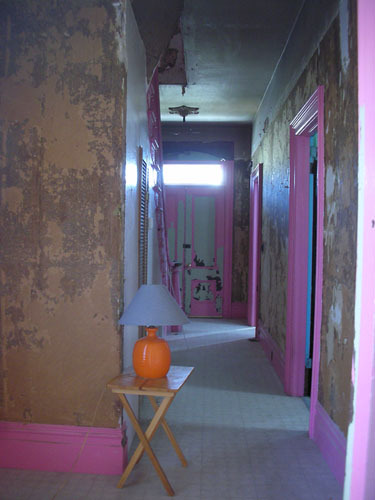 Anyway, before we deal with the ceilings and roof, we're probably going to spend a bunch of quality time stripping wallpaper from the hallway. In part because this will give us the opportunity to design and build a scaffolding for working on high-up spaces without having to be on the ladder. I would like this a lot, speaking as the one who spends days on ladders doing plaster work. I need to figure out how to make a scaffolding that can go over the stairs and up into the upper hall without making it impossible to use the stairs when it is in place. That should take most of the spring. What ever possessed them to lower the ceilings in the first place? Everything looks so much better now, even battered by the deconstruction. Kitt, I think they lowered them in part to try to save on heating bills, and in part to cover up the water damage from the roof leaks. Because god forbid you should repair the flipping roof. Wow - it really looks amazing. Love that shot up the stairway, showing the graceful curve and the wall niche. As you peel away all the "improvements", it really seems like the house is "breathing" better. And that is one neatly-arranged dumpster! 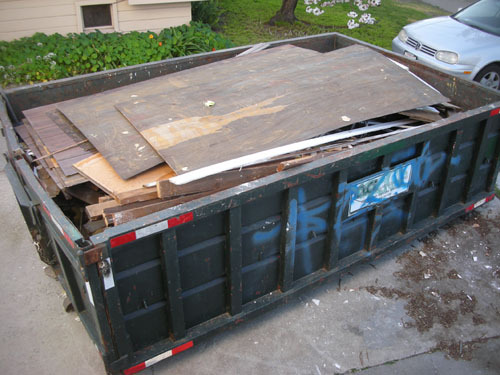 Bryan, we are super-organized about dumpster loading, but it just looks tidy because we laid the paneling on top at the end; the rest is the usual dumpster jumble. It looks so much better. It would be nice to save the plaster, but I know how hard that is. Even cracked non-water damaged plaster is difficult to repair. For the lights you took off, you could just put pigtail lights in. We finally got rid of the one we had in our hallway for 3 years. 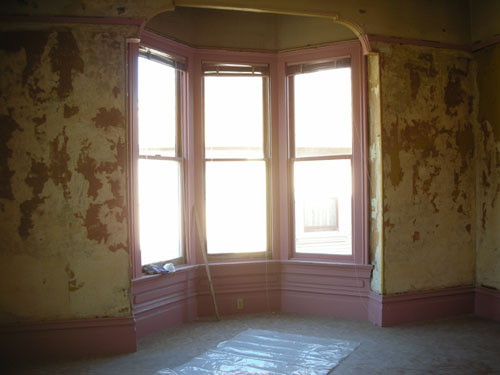 I'd get rid of the lath and plaster for house that old. we did it in my SF Victorian. replaced with non paper faced gypsum board then a new plaster skim coat. 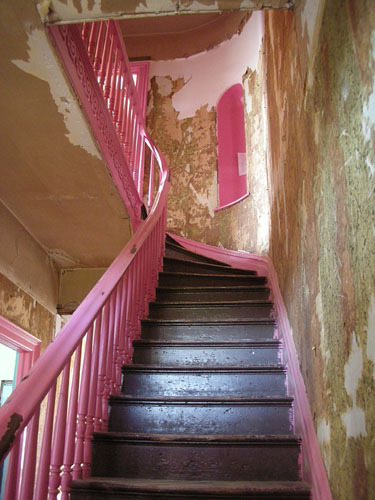 beautiful..
please tell me you're going to get rid of ALL of the pink trim. pretty bad. paint it all white. We do eventually plan to have all the plaster out; it's not reliable and I don't want to die from a plaster ceiling falling on me. However, we are trying to conserve money right now, so we're only going to replace plaster as needed. I do think it will be needed for most of the ceilings, because those are harder to stabilize. 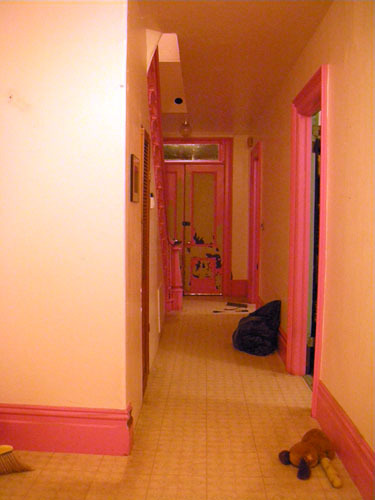 As for the pink trim, I hope nobody has ever gotten the impression that we intended to leave it pink. Wow, that looks like the biggest before&after project ever in the making. It's *so* ugly, but at the same time *so* beautiful. I love the curve and carvings on the stairs. The bones are just wonderful. Love to watch your progress. That's some impressive then and now shots. It's starting to really sing. Can't wait to see what your finish choices will be.